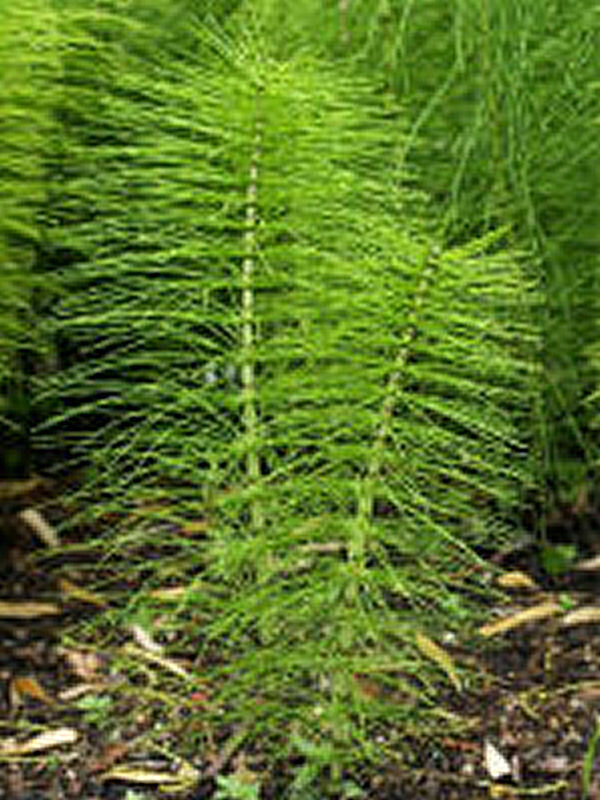 Horsetail is a thin, and sterile perennial plant with a rhizomatous stem that looks like the tail of a bird or a horse. It is reproduced by its spores instead of the seeds. It is also known as Pewterwort (due to its use in polishing pewter and wood), Scouring Rush( due to the abrasive coating of silicates on its stems which was used for scouring metal pots). It's other common names are Shavegrass, Candock, Paddock pipes, Bottle brush, Horsetail Fern, Field Horsetail, Common Horsetail or Giant Horsetail. Ancient Greeks, Roman and Chinese herbalists have been using Horsetail for its health benefits for centuries. Aside from its health benefits, its leaves have been used for dyeing a soft green colour, the stalks were used to make whistles to call spirits, Indians used it to polish wooden tools, in Japan horsetail is still used as a finest sand paper to sand the wood before varnishing and in shampoos and cosmetics. However, horsetail is valued more for its health benefits due to a number of great minerals and other nutrients it contains, such as manganese, calcium, iron, flavonoids, caffeic acid esters, saponins, tannins, alkaloids, fatty acids, phytosterols, glycosides, phenolic acids, aconitic acid, and silica. Similar to Alfalfa plant, Horsetail is capable of absorbing unique minerals from the earth like Silica which are not found in many other plants. Horsetail is known for its anti-inflammatory, antibacterial, antimicrobial, antioxidant, coagulant, demulcent, diuretic and astringent activity. Reportedly, it has been used in the treatment of a number of health conditions which include brittle bone, hair, teeth and nails, white spots on nails, gingivitis, tonsillitis, inflammation of the mucous membranes of the mouth, rheumatic disorders, edema, osteoarthritis, diabetes, acne, wounds, itchiness, rashes, burns, frostbite, chilblains, athlete's foot, cracked and tired feet, drawing out pus from boils and carbuncles, ulcers, fistulas, herpes simplex, dyspepsia (impaired digestion), gastrointestinal conditions, cardiovascular diseases, respiratory tract infections, bronchitis, fever, malaria, bladder problems, urinary tract infection, bed wetting in children, kidney stones (nephrolithiasis), prostate problems, hemorrhoids, muscle cramps, tumors, broken bones, fractures, sprains, nose bleed and other heavy bleeding. Horsetail is also known to strengthen the body's immune system. The antimicrobial and anti-inflammatory activity of Horsetail may help with the inflammation and infection caused by Boils and Carbuncles. Its salve, compress and poultice is used to draw out the pus from boils, carbuncles and sores. To make a compress simply soak crushed dried Horsetail herb into lukewarm water for 15 minutes. Wrap the soaked Horsetail herb in a small piece of cheese cloth and apply it onto the carbuncle or boil. The use of hot and cold compresses of this Horsetail poultice 2 to 3 times daily may help reduce the inflammation and draw out the pus. To alternate between the hot and cold compress, simply make two poultices and dip one in small amount of warm water and the other in cold water before applying. Apply each compress for about 5 minutes each, at least 3 times in one session. To reduce the inflammation and pain, a paste made by Horsetail leaves or its extract can be applied onto the affected area. To make the horsetail paste, add a small amount of water to half a teaspoon of Horsetail extract powder or soak crushed horsetail leaves into warm water. Apply this paste after hot/cold compresses to speed up the healing process. Horsetail contains minerals that may help with weak and brittle fingernails and white spots in the nails. Reportedly, simply taking Horsetail extract daily and soaking the brittle nails into Horsetail infusion may strengthen and repair the nails. To make Horsetail infusion, steep 2 teaspoons of dried herb in a boiling cup of water for 10 minutes. Let it cool down and soak the nails for about 20 minutes. After 20 minutes of soaking, pat dry the nails and apply a mixture of equal parts of lukewarm extra virgin olive oil and lemon juice thoroughly. Wrap your fingers with fine cotton cloth for overnight. Repeat this remedy for at least 3-4 times a week. Horsetail tea is known to be beneficial for dry cough , bronchitis, nasal congestion, and fever associated with cold and flu. Also inhaling vapours from boiling Horsetail tea may help relieve nasal congestion. Remedy for cough and other respiratory condition is to drink Horsetail tea for two to three times daily. If symptoms last for more than five days, consult with your doctor. Horsetail is believed to have anti-fungal, antimicrobial and anti-inflammatory properties. Therefore, Chinese herbalists have been using Horsetail topically for centuries in the treatment of foot conditions such as Athlete's Foot, frostbite, and chilblains as well as cracked and tired feet. Chilblains is a skin condition caused by the exposure to extreme cold and humidity which damages the fine capillary beds in the skin of feet causing redness, inflammation, itchiness and blisters. Simple remedy is to soak affected feet in a Horsetail soak for 15 minutes. To make Horsetail foot soak, infuse 10 teaspoons of horsetail extract powder or dried herb in 4 cups of water. Soak your feet every other day for 15 minutes then moisturize them with extra virgin coconut oil and keep them warm with cotton socks on. A study found that patients diagnosed with type II Diabetes who were administered one single oral dose of Horsetail extract had significant lower blood glucose levels within 90-120 minutes. Therefore, taking Horsetail extract capsule once daily before every meal may be beneficial for type ll Diabetes for no longer than two months. A few studies and laboratory research shows that Horsetail may have diuretic activity and may enhance body's ability to produce urine. It is believed that rich at minerals and vitamins Horsetail may also help re-mineralize and replace the mineral stores of the body exhausted by increased urination due to its diuretic activity. The German Commission E have approved Horsetail use as a diuretic for edema and the National Institutes of Health (NIH) also rates horsetail as a grade B for its use as a diuretic. The B grade stands for good scientific evidence for Horsetail's use. Therefore, taking Horsetail extract or its tea daily for two months may be beneficial for the fluid build up in the legs and rest of the body caused by edema. Studies suggest that the coagulant and hemostatic activity of Horsetail may help minimize or stop the internal or external bleeding as well as excessive menstruation. Also the anti-inflammatory agents in Horsetail may relieve the inflammation and discomfort caused by inflamed wounds, injuries and menstrual cramps. Simply drink one cup of Horsetail tea 2 to 3 times daily. To make Horsetail tea, add 1-2 teaspoons of dried horsetail into a cup of boiling water and let it steep for 7 to 10 minutes. Strain out the tea and drink it warm. Horsetail tea bags can be a good alternative to loose horsetail herb. Gargling with a mouthwash made with Horsetail tea or its extract may help with the inflamed tonsils, mouth sores and bleeding gums. To make Horsetail mouthwash, boil one teaspoon of Horsetail herb in one cup of water for 7-10 minutes or add 3-4 drops of Horsetail extract into one cup of lukewarm water. Simply gargle and swish this liquid three to four times daily until relieved. Research shows that silica in Horsetail may help promote hair growth and strength and may also be beneficial for hair loss, dandruff, and split ends. Therefore, drinking Horsetail tea and massaging its herbal tincture and washing the hair with Horsetail extract mixed shampoo may be effective to achieve dandruff free nourished, strong, lustrous, and rejuvenated hair. Herbalist believe that massaging 3-4 drops of Horsetail extract or tincture mixed in 2 tbsp of extra virgin coconut oil or extra virgin olive oil may help stimulate the hair growth and decrease dandruff by improving the circulation in the scalp and strengthening hair follicles. Simply massage the Horsetail oil mix into the scalp for at least 10 minutes 3-4 times weekly. For hair wash, add 3-4 drops of Horsetail tincture into your regular shampoo and wash as normal. Also after shampooing, pour half a cup of cold Horsetail tea into the hair and wash it out after 4-5 minutes just like conditioner. Taking Horsetail extract capsule or drinking one cup of Horsetail tea for two months may add to the effectiveness. The anti-inflammatory and hemostatic activity of Horsetail may alleviate the pain and help decrease or stop the bleeding caused by hemorrhoids. Simply drink one cup of tea before every fiber rich meal. Fiber rich meal minimizes the risk of constipation which is considered one of the causes of pain associated with hemorrhoids and hemorrhoids itself. According to the University of Maryland Medical Center, a study shows that due to the diuretic activity of Horsetail, it may be beneficial for patients with kidney stones. Especially the uric acid kidney stones which are usually associated with Gout disease. Normally, uric acid kidney stones develop when the urine excretion is lower compare to uric acid in the bloodstream on the whole and uric acid deposits or stones are lodged into urinary canal and kidneys. It is believed that drinking Horsetail tea two to three time daily may increase the urine production and help flush out kidney and gall bladder stones (Cholelithiasis) as well as may help relieve the symptoms of Urinary Tract Infection (UTI). Researches suggest that lack of Silica in the body may cause memory loss. Horsetail contains silica which may improve bad memory by strengthening the connective tissues of brain, nerve cells and spinal cord. Also Nicotine found in Horsetail is a stimulant which is known to stimulate the brain and nervous system. Therefore, taking one or two capsules of Horsetail extract daily for two months may help minimize the symptoms. According to the University of Maryland Medical Center, a study done in Italy found that women with osteoporosis who took 270mg Horsetail extract for one year had improved bone density. A few other small clinical studies suggest that Silica in Horsetail may help absorb and use calcium in the body and may enhance bone flexibility and heal fractured bones, pulled hamstrings and dislocated joints by strengthening the connective tissues and cartilage and by raising the bone density. It's anti-inflammatory activity may also help relieve the rheumatoid arthritis. Therefore, regular consumption of Horsetail extract along with a calcium supplement may be beneficial for osteoporosis, arthritis, and conditions caused by low bone density. It's suggested to stop taking Horsetail for one week after every one month of its regular use. Studies have shown that anti-inflammatory, anti-bacterial, anti-septic, and anti-oxidant agents and silica in Horsetail may give it the ability to heal wounds, rashes, burns, skin lesions and acne. Silica is known to help form collagen which is important for the development and the maintenance of healthy connective tissues throughout the body. Therefore, Horsetail extract is widely used in anti-aging, anti-wrinkle and other cosmetic products. Simple home remedy is to apply Horsetail extract paste onto the affected skin for at least 20 minutes 4-5 times a week. By drinking Horsetail tea, its anti-inflammatory and antioxidant activity may delay the aging process by strengthening the connective tissues and may help relieve the inflamed and irritated skin. For acne, diluted and cold Horsetail tea can be used as a toner after washing the face every night. Simply dab a cotton swab into the diluted tea and apply it all over the face avoiding the eyes. Studies have shown that Horsetail extract may be beneficial for patients suffering from nocturnal incontinence (bed-wetting), bladder and urinary tract infections and weakened bladder. It may also relieve the persistent urge to urinate with Urinary Tract Infection (UTI). Suggested remedy is to take one capsule of Horsetail extract two to three times daily. It is reported that taking a bath with Horsetail tea for at least 15 minutes two to three times a week may be helpful for UTI and Bladder weakness. For steam bath, steep 10 teaspoons of dried Horsetail into one quart of boiling water for 10-15 minutes and add the strained tea into the bath water. What are the Side Effects of Horsetail? Similar to most dietary supplements, Horsetail is safe when taken short term and in moderation. If you are taking any other supplements or medication, consult with your health care provider before the therapeutic use of Horsetail. People with vitamin B deficiency or alcoholics (who are usually Thiamine deficient) should avoid Horsetail because it contains an enzyme, thiaminase, and its overdose and longer term use destroys thiamine (B1). Do not take Horsetail supplements, if you are using any kind of nicotine patches, or are sensitive to nicotine, or are taking any diuretics or laxative drugs because Horsetail has diuretic and nicotine properties which may cause overdose of these ingredients and may lead to serious health problems such as dehydration or low potassium (hypokalemia) and nicotine overdose symptoms such as rash, cold hands and feet, abnormal heart rate, fever, muscle weakness, and weight loss. Pregnant, lactating mothers and children should not take Horsetail because of its Nicotine content. Horsetail should be used short term only, for a maximum of two months unless advised by your doctor otherwise. Ideally, the consumption of Horsetail supplements should be stopped for one week after one month of its regular use and be continued on for another month. Horsetail is available at herbal food stores in the form of dried leaves, liquid or powder extract, tincture, tea bags and capsules. The tincture and liquid extracts can be diluted into water. When buying Horsetail, look for Equisetum arvense because most of the other species of Horsetail may not be safe for oral consumption. When buying Horsetail supplements, capsules can be the best option because they are usually standardized and the amount of silica and other components of Horsetail can be controlled. Horsetail in any form should be stored in dark and airtight containers. Discover simple solutions for easing the pain associated with hemorrhoids. What dose of Horsetail do you take regularly? One, two or three capsules/tea bags per day? I enjoyed reading about this fabulous herb. I have been using Horsetail for over 30 years and I have never stopped it for a week and then resumed it. And I never had any problem from using it constantly. You may have low sodium levels in the first place. I am using Horsetail capsules to help Tinnitus. Does anybody know if it helps? Nokuthula, are you in SA? If so, there's also a brilliant Horse shampoo on the market at animal feed stores and at Dischem. It has an excellent reputation for regrowing hair pretty fast, according to others. I haven't used it myself. I make sure I never take tinctures for longer than a few weeks at a time and then have a break. I originally bought horsetail tincture for my cats' UTIs which clears blood in the urine, among other things. Now I'm using it, instead of sprouting alfalfa seeds, which is brilliant stuff all around. Thanks to the author for a very well-written article. Amazon carries certified organic Horsetail from Frontier Herbs. Also you can use Comfrey, it is also known as Knit-bone. I bought a hair, nails, skin supplement that contains horsetail at Wal-Mart if anyone is seeking horsetail as a supplement. It also contains other supplements. I'll post at a later date about the results. Just bought Horsetail Grass Powder. I'm using it to speed up the healing process of a fractured wrist. How much do I use? And to make tea out of the powder, should I just pour hot water over it? Can't find an answer - can you help?